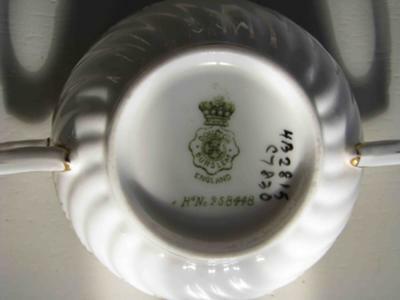 Both the cup and saucer are marked in green: Doulton Burslem England – Rd.No: 258448 and then handwritten in black glaze to the side: HB 2815 C7830. On the saucer, but not on the cup, there are also some impressions that say: Doulton and some numbers that are hard to make out. 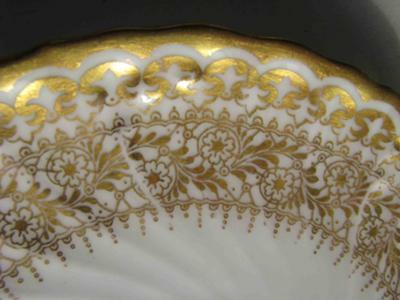 I have included some pics and looking online, it looks like this tea set dates to between 1896-1897, is this correct? The Doulton cup and saucer have the most amazing deep ring when lightly tinged with my finger. I knew I loved the set then and keep it safe, but am nerve-wracked about breaking it because it’s so light and delicate. I am curious as to whether this set has any value to the general public? 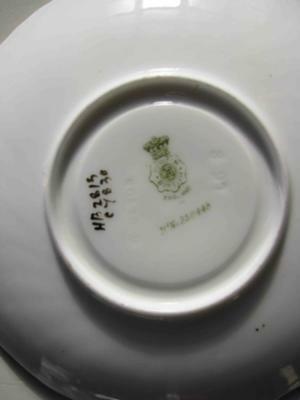 The Doulton makers marks on your set indicate that yes, the design was introduced around 1896-97 however the H code suggests a manufacturing date in the 1920s. 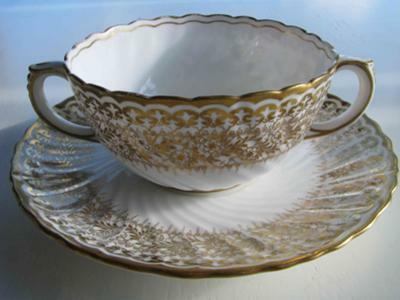 It is a very nice set and it is collectable, so providing the gilding is in good order and there is no damage it could be worth something between 20 and 50 pounds.